Every day, millions of drivers flood America's streets, driving to and from work, school, and social events. The importance drivers place on safe driving cannot be understated. Refraining from drinking and driving and distracted driving, choosing to wear a seat belt, and following the speed limit are all positive behaviors that help keep drivers, passengers, and other road users safe. Unfortunately, many drivers taking prescription, over-the-counter, or illegal drugs do not consider the drug's effect on their driving skills. Make no mistake, any form of impaired driving is illegal regardless of whether the impairment is caused by drugs or alcohol. 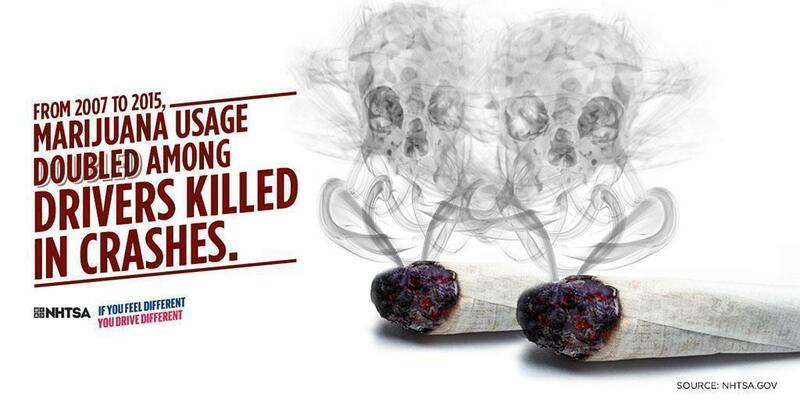 It doesn't matter what term is used, if a person is high, stoned, wasted, or drunk he or she is impaired. Driving while impaired by any substance is illegal and can be deadly to the driver and other road users. It's that simple. If you are driving under the influence of any drug, legal or illegal, you can be arrested for a DUI. In 2017, there were more 12,000 crashes in Pennsylvania involving impaired drivers. Of those, 270 resulted in fatalities. A survey on alcohol and drug use by drivers (PDF) conducted by the National Highway Traffic Safety Administration (NHTSA) found that nearly one in four weekend drivers tested positive for at least one drug that could affect driving skills. If you think driving while high won't affect you, you are wrong: It has been proven that Tetrahydrocannabinol (THC) — the chemical responsible for most of marijuana's psychological effects — slows reaction times, impairs cognitive performance, and makes it more difficult for drivers to keep a steady position in their lane. New medication or increased dosages can affect people differently. If you are taking a new prescription drug or a higher dose of a current prescription drug, do not drive until you know what effect it has on your judgement, coordination, and reaction time. Any effect could impair your driving ability. Even if a doctor writes a new prescription or increases a current dosage, be sure to discuss with the doctor how the drug might affect your driving abilities and whether it is safe to drive while taking the medication. You can also ask the pharmacist when you pick up your prescription. Always report all medications to the doctor (prescription, over-the-counter, and illegal) so the doctor may accurately provide counsel on whether it is safe to drive while taking the medication. Certain medications may not impair you on their own, but if taken with a second medication or with alcohol, they may cause impairment. Even something as simple as cold medication or an over-the-counter sleep aid can impair driving. If it does, you will be arrested for a DUI. Remember, any form of impaired driving is illegal. On average, a DUI can set you back $10,000 in attorney fees, fines, court costs, lost time at work, higher insurance rates, car towing and repairs, and more. The financial impact from impaired-driving crashes is devastating. If you are driving while impaired by drugs or alcohol, you could be arrested for a DUI. Give your keys to a sober friend and ask them to help you get home safely. Do not drive. If a driver has ingested an impairing substance, such as prescription drugs, sleep medication, marijuana, or any form of illegal drug, they should not drive. Passengers should never ride with an impaired driver. If you think a driver may be impaired, do not get in the car with them. If you are drug-impaired, pass your keys to a sober driver who can safely drive you to your final destination. Like drunk driving, it is essential that drug-impaired drivers refrain from driving a vehicle. It is never okay to drive while impaired by any substance. If You Feel Different, You Drive Different. Have a friend who is about to drive while impaired by drugs? Take the keys away and arrange to get them home safely. Don't worry about offending someone—they'll thank you later. For more information, visit www.trafficsafetymarketing.gov or www.penndot.gov/safety.